In recent wind tunnel testing, Speedplay, Inc. has discovered the aerodynamic importance of pedal choice. 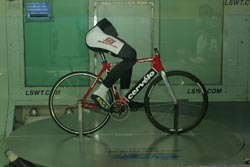 The first known wind tunnel test of clipless pedals, conducted at the San Diego Air & Space Technology Wind Tunnel, established a notable difference in the coefficient of drag when comparing Speedplay pedals to other brands. "In order to measure the wind resistance of pedals, I created a fully-articulated robotic cyclist to accurately replicate a real-life racing scenario and to eliminate human variance in the wind tunnel," explained Speedplay's pedal designer, Richard Bryne. "The robotic cyclist pedaled the bike at a cadence of 100 rpm and at a speed of 30 miles per hour in each test." Speedplay Zero pedals bested the two other clipless pedal brands tested by posting a substantially lower coefficient of drag score. While each of the other pedal brands posted the same coefficient-of-drag score of .243, Speedplay pedals produced a lower drag score of 237. The reduction in wind drag of Speedplay pedals, when converted into time saved, results in an incredible 33 seconds per hour advantage. "I suspected Speedplay pedals would prove to be more aerodynamic than the others because of their minimal frontal area, but even I was surprised by the margin of difference," said Bryne. To put the significance of this speed advantage into perspective, using Speedplay pedals is comparable to switching from a standard front wheel to a deep-profile, aerodynamic front wheel, according to available data. This aerodynamic advantage is important to competitors because it is easier to gain speed by reducing drag than by increasing power. The result is also good news for speed seekers who appreciate good value, since a change to Speedplay pedals is an inexpensive way for a cyclist to gain a meaningful increase in speed.